Wild Spirit offers a wide range of bushcraft and woodlore courses, varying from a 1 day introduction, to the more demanding 4 day bushcraft survival. We offer 1 day Wild food foraging and Coastal foraging courses. Set in a beautiful location, contained in 70 acres of woodland on the Merthyr Mawr Estate in Bridgend, a stone throw away from one of the most scenic coast lines in South Wales. Our courses cover a wide range of fascinating skills and techniques that are sure to enthuse and inspire. **A Wild Spirit foraging course or private session makes a memorable and unique present. Gift Vouchers are available for any of our courses, and workshops. Bespoke vouchers for private sessions can also be considered – please contact us for a quote, or select Gift Voucher on the Make a Booking page. If you would like a tailor made Bushcraft Course, please contact us to discuss your requirements, we are very flexible and can accommodate most needs. Coastal Foraging is back this year as well as our ever popular Woodland Wildfood course. 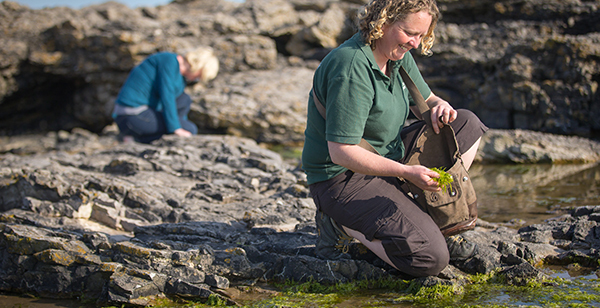 Join us for a spot of beach foraging, finding a wealth of tasty treats and putting your bushcraft skills to the test as you prepare them for lunch beach style! The Glamorgan Heritage Coast offers a unique wild food offer because of the massive tidal range along this coast, culminating in a culinary delight. Spend time exploring the beaches foraging for edible delights; learn about sustainable foraging, and the seasonal variations of beach food. Once collected we will learn a number of bushcraft skills to both prepare our treats, make fire on the beach and then cook ourselves an unrivaled beach buffet! Wild Spirit Bushcraft offers 1,2 3 and 4 day courses covering everything from the basic to advanced essential skills of woodland survival, woodlore and wild living alongside nature. Check out our course pages to find the right course for you! This package is designed for corporate businesses as a team building exercise, through the medium of bushcraft. The exercises are designed to bring a team of clients together in a survival situation within a woodland environment. During your course Wild Spirit Bushcraft can offer a unique opportunity to camp out overnight under the stars, in one of our bell tents which sleep 4.